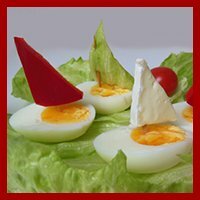 My aim here is to present you with a lot of different types of fun snacks for kids that are easy to do, fast to prepare, and don't contain any exotic or difficult-to-find ingredients. Chances are you probably already have most of what you need at home in your fridge or cupboards. When you use these recipes for healthy snacks for kids, I encourage you to not feel too bound by my choice of ingredients. In many of the recipes you can easily replace one kind of vegetable or fruit with another if you don't have what I suggest available, or your child doesn't like it. Please by all means, feel free to experiment (and save yourself a potential extra trip to the supermarket). Also, I'm not very specific when it comes to cooking time in the oven or precise level of temperature. I tend to just keep a close eye on how the snacks are doing and take them out of the oven when they look done. This seems to be enough for me to make lovely and tasty snacks that my kid loves. I hope you will be okay with this rather relaxed way of cooking. 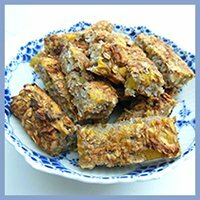 The healthy kids snack recipes on this page are fairly different from each other in terms of how satiating they are. This makes them ideal for different purposes. Some snacks are very light and refreshing, thus great for a quick refreshment when you don't want your child to feel too full. Other snacks are a bit more heavy, more meal-like if you will, and works great if your child is in need of more substantial energy e.g. before sports or in midafternoon. All these healthy kids snacks are nutritious, however, and by that I mean that they are made from healthy foods and contain no extra added sugar. 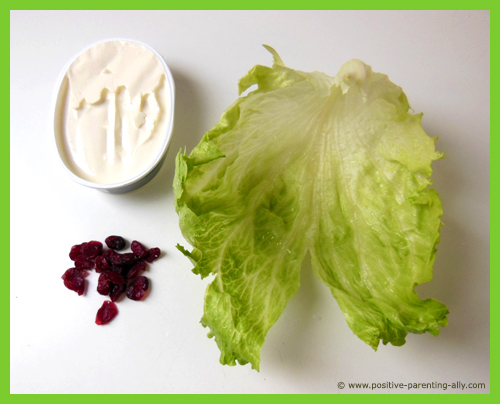 This one of healthy kids snacks is extremely quick to prepare, and a great choice when your kids just need a light snack, and you want it to be really easy to make, and still tasty and healthy to eat. All you need is a salad leaf, some cream cheese or peanut butter, and some berries, olives or nuts, or whatever your kids love. 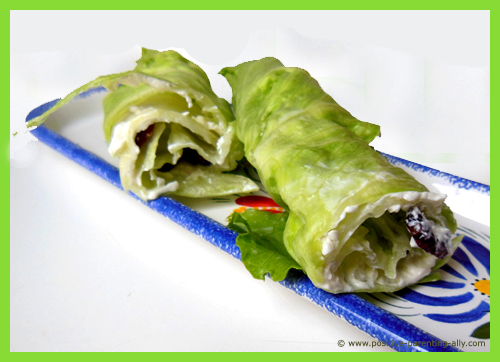 Spread cream cheese or peanut butter onto a large salad leaf. 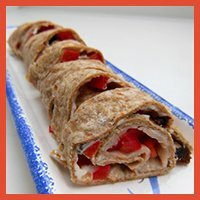 Spread some berries, nuts or olives and roll it up. 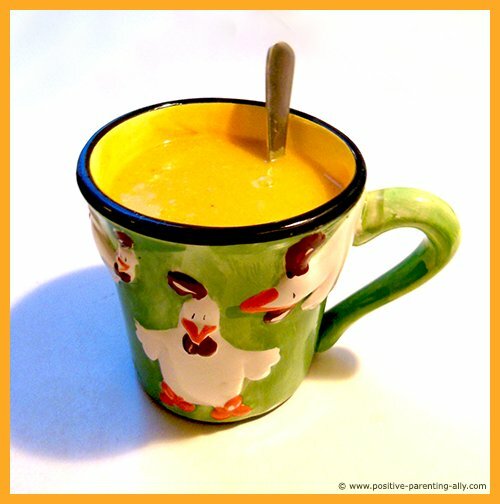 This snack is one of my son's favorite get-your-energy-up-before-sports-snacks, and basically it's just pumpkin soup. What makes this soup a snack is really the portion size, and the way it is served: in a cup! 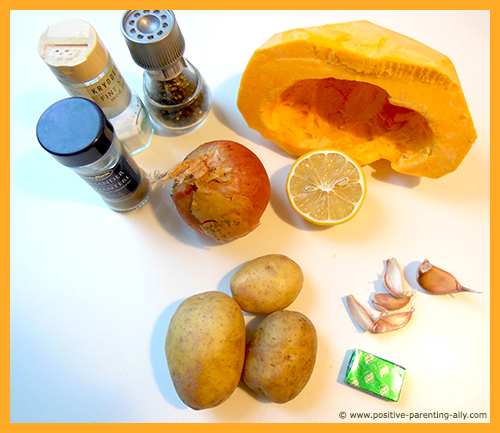 To make this particular soup, what you need is a pumpkin, an onion, some potatoes, some cloves of garlic, a lemon, some bouillon (e.g. a cube), and cream cheese (I didn't have cream cheese that day, but if you have some, I would definitely put some in. It really adds that last touch of yumminess). Cut out the onion and garlic finely, and cut out the pumpkin in small chunks and fry it all briefly at high heat in a pot. Cut out the potatoes and add them to the mix. Put in some water (not too much, just a bit more than half way up the veggies)and let the whole thing simmer with a lid until everything is soft. When everything is cooked, pour away some of the water if there is too much, and start blending it all. Once nice and smooth, put the soup back on the stove, and add the cream cheese and bouillon cube. Now comes the fun part: tasting it and spicing it up, which my son insists on participating in. 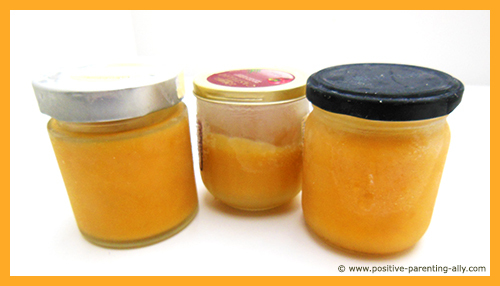 So call out for your child and let him or her have a go at tasting it, and start adding lemon juice, salt and pepper. If the soup is too thick, you can always add water. Once happy with the taste, serve your child a portion in a cup. Fill as many small pots with soup as you can and then freeze them. This allows you to easily take out a portion in the mornings, and it will be ready to be heated up once your kid comes home from school. In Denmark, wholegrain bread is a big thing. It's the thing. Everybody who has to bring a lunch pack for work or school brings a couple of slices of wholegrain bread with some sort of topping. Apparently it's an acquired taste, as many foreigners find this type of bread a bit too sour, but for the traditional Dane, it everyday food. Plus, it's very, very healthy. A lot healthier than white bread. It doesn't really compare. 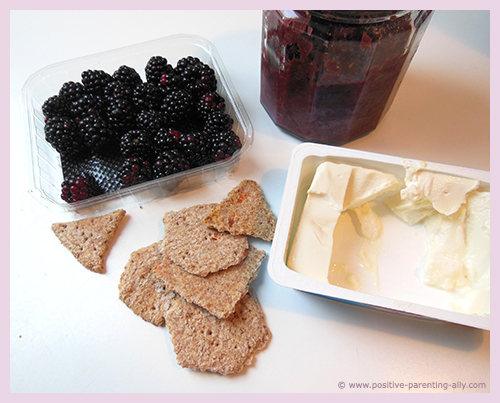 So making quick healthy kids snacks from wholegrain bread comes very natural to me. Maybe your kids will like it too? 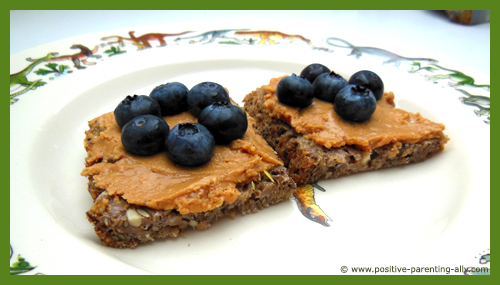 All you need for this snack is a slice of wholegrain bread, some peanut butter and some blueberries. Cut a slice of bread in two, spread some peanut butter on them and then decorate with the blueberries. Or even better, have your child do the decorations. That's it! Really simple, really tasty, and only takes a few minutes, tops. 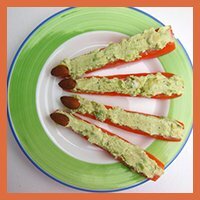 Just like the quick snack for kids above, this one is also really easy to do, and it only requires a few ingredients, most of which can easily be replaced with others. Take spoonful of cream cheese and mix it with a little bit of jam. Not much, just enough to give it a bit of taste and color. You can use any type of jam you have. And if you don't have any, it's no problem. It tastes fine with plain cream cheese, too. 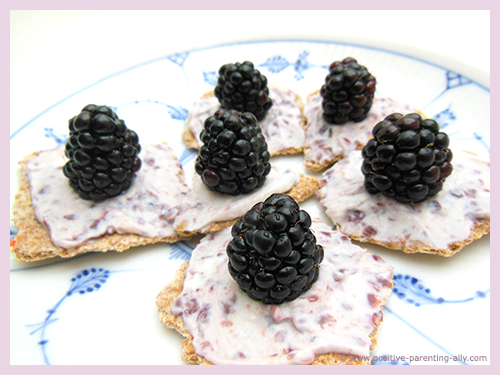 Spread some cream cheese onto the crackers, and top them off with one delicious and juicy blackberry on each cracker. Not only are these snacks juicy and delicious, the are also really pretty and decorative. This cake has been presented in many different versions on these healthy snacks for kids pages as my son really has a thing for them. It's also really easy to do, as you don't have to measure or weigh anything. The single most important ingredient to remember is the banana. Without the banana, it won't work. The banana works a bit like glue in the dough, binding the ingredients together. But other than that, you can put in pretty much anything you like. In this version of the cake, I have put in 2 bananas, some blueberries, some chopped up walnuts, some oats, and some shredded coconut. That's it - no eggs or flour required. 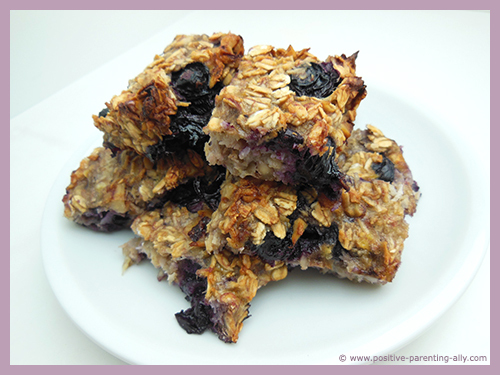 Mix everything together: the mashed bananas, blueberries, chopped up walnuts, oats and coconut. And again, there are no rules here. Just put in what feels right until the dough has a nice consistency. Then put the dough on a baking tray and place it in a medium heated oven until it has turned nicely golden and looks done. Take it out and wait for it to cool off. Once cooled off, cut it into small squares and serve. 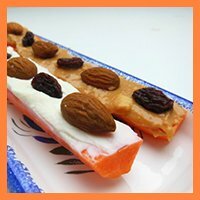 This kind of healthy kids snacks is ideal as a mini meal as it is a bit on the heavy side, at least when it comes to snacks. 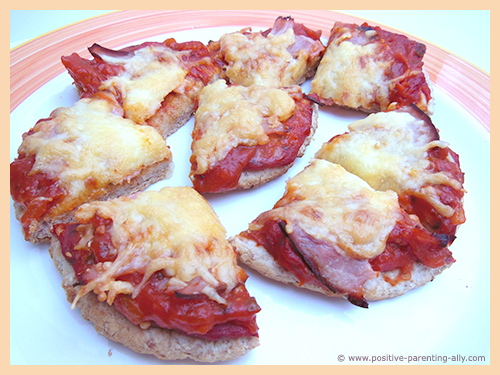 All you need is wholegrain pitas, some tomato sauce, cheese and ham (or whatever kind of protein your kid prefers). 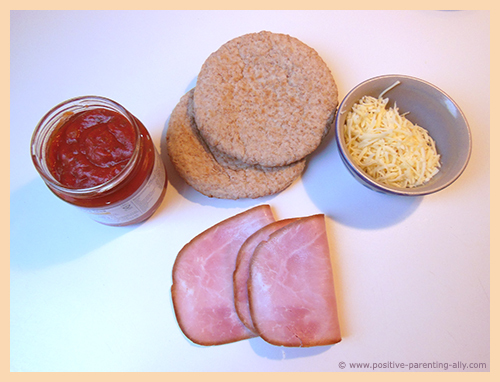 Cut the ham into small pieces and put in on top of the tomato sauce. Sprinkle some cheese over the lot. If you have any oregano or thyme, you can sprinkle a bit of that onto them, too. Once you're happy with your toppings, put them in a well-heated oven and observe them closely until the cheese has turned golden. Take them out and let them cool of for a bit. Then cut it out into finger-friendly pieces. Who needs expensive ice cream or frozen yogurts from the shops, when it is just as easy to make your own frozen snacks ... which are probably going to be a lot healthier too. My son really loves frozen snacks, and it doesn't matter if it is summer or winter. Popsicles are always a hit. 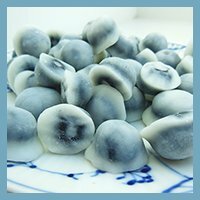 Making your own frozen snacks for kids is really simple, with the only limit being your imagination. 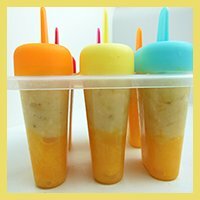 There are many ways to make popsicles at home, and if you're in a hurry, and don't feel you have the energy to go all in on making something extravagant from scratch, it's okay to take shortcuts. This is an example of such a short cut. All you need is some yogurt (here we have bought one with strawberry flavor), some fresh strawberries and some popsicle forms and sticks. Wash and cut out the strawberries in small pieces. 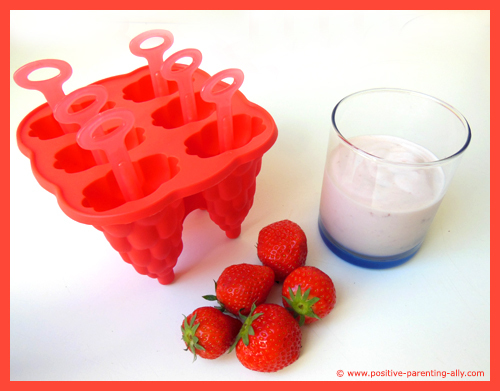 Mix the strawberries and the yoghurt, and pour the mixture into the popsicle forms. And voila, after 5-6 hours you have lovely delicious yoghurt ice creams at home. 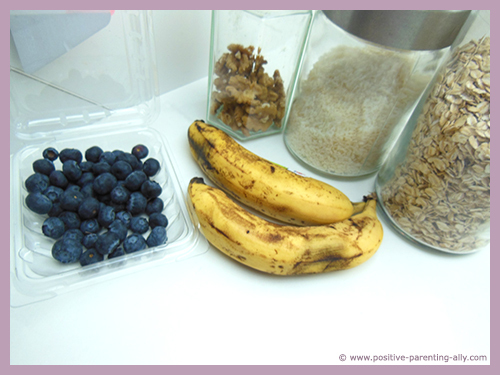 This healthy snacks for kids example is another quick one to prepare. It literally only takes a minute or two (and then some hours to freeze of course). All you need here is fruit juice, fresh fruit and some popsicle forms. I had organic orange juice and an apple, so that was what I used. 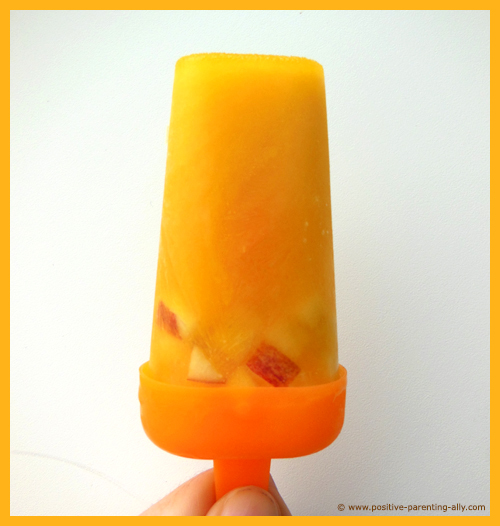 Cut out the apple into small pieces, and put them into the popsicle forms. Pour the juice on top of them all the way to the top of the forms. After 5-6 hours they should be solid. Enjoy! 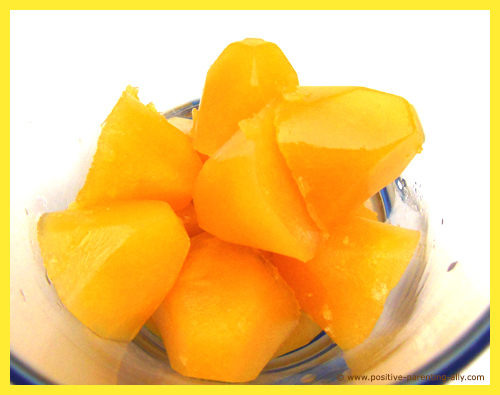 You can also add gello to the juice, so they turn to jelly when melting. 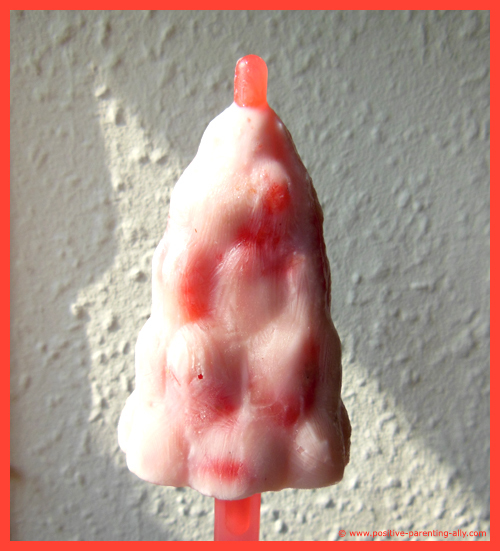 Such lollies are especially good for frozen snacks on the move, because it doesn't matter if they melt, making them ideal for smaller kids. 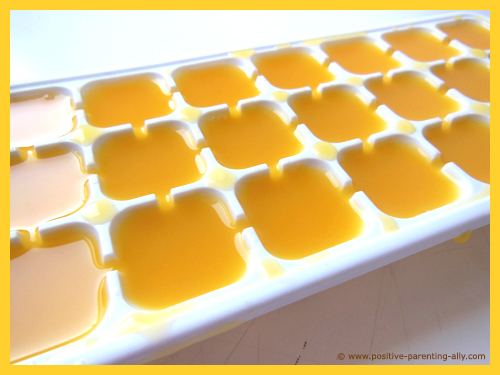 These juice cubes are a lot of fun and can be used on many occasions. Your kids can put them in their drinks, e.g. water and observe how it looks when the cube melts and the color mixes with the water. Or you can put some cubes in a glass and give your kids a spoon so they can put them in their mouths, and easily take them out when it gets too cold. 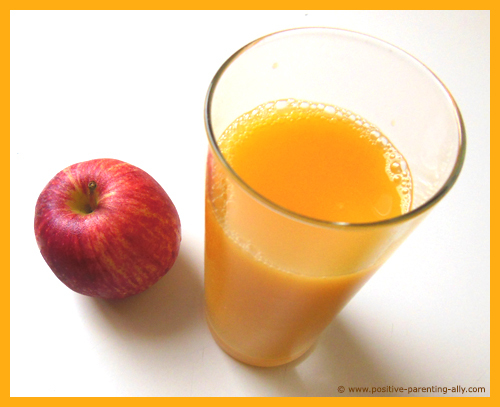 Pour the fruit juice (here I have used orange juice) into an ice cube maker and freeze until solid. 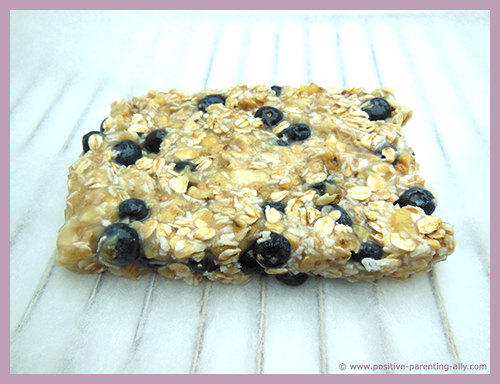 I hope you enjoyed these quick and easy recipes for making healthy kids snacks at home. 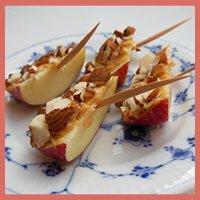 If you'd like more inspiration, there are plenty of similar fun snack recipes in the links below this article. Want to stay in touch and get the latest news? 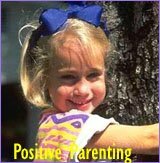 I understand that you will use my information to send me Positive Parenting Ally's newsletter. Being a parent can feel like a double-edged sword. Life with kids may feel like the greatest gift you have ever received, while at the same being hugely challenging, often leaving you confused, stressed and overwhelmed. When we feel like this, we've lost touch with ourselves. We can't hear our own inner voice, and it's difficult to know what is 'right' for us and how to act. 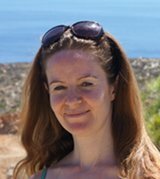 I offer in-depth parent coaching to help you regain your balance and get back in touch with yourself. 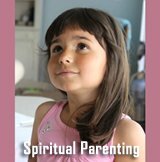 From a place of inner peace and clarity, your will find your own answers which will help you reconnect with your child from a place of unconditional love and acceptance. Read more about my parent coaching here. 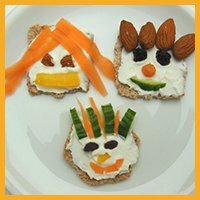 Fun, Healthy Snacks for Kids and Easy Snack Recipes Ideas. 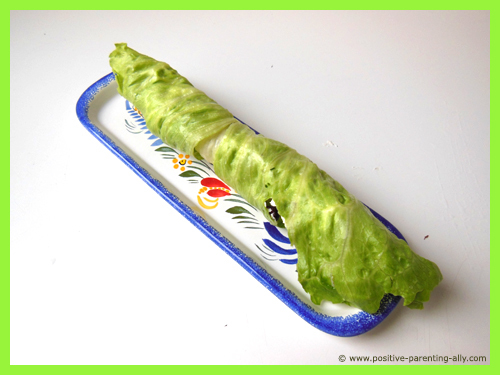 Easy After School Snacks Your Kids Will Love - Encouraging Healthy Eating for Kids. 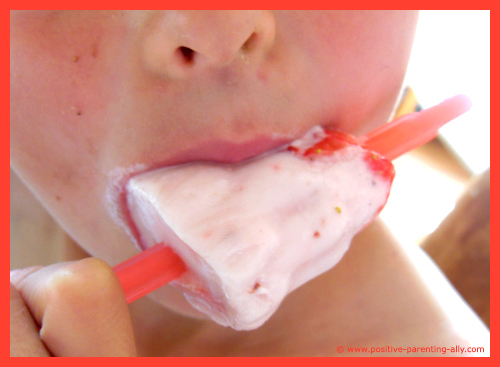 A Wonderful List of Fun Snacks for Kids - Easy to Do, Healthy to Eat. The Simplest, Most Natural Way to Good Moods and Emotional Balance. Quick to Make with only a Few Ingredients. Easy Snacks the Whole Family Will Enjoy. - Going for Delicious without Giving in to Sugar. Spooky Finger Foods and Scary Snacks.